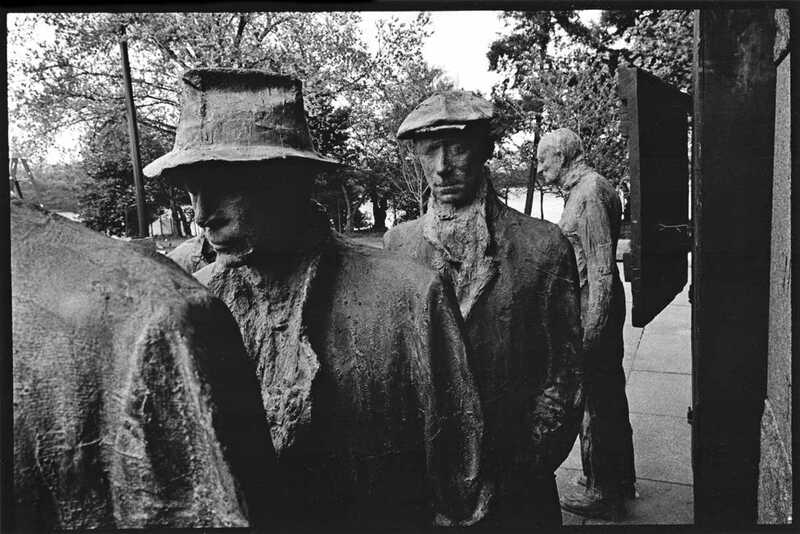 I remember the day in June 1991 at the studio, when George Segal told me the FDR Memorial was finally approved. When he talked about the Memorial, George seemed to have some reluctance about working with the government on this project. He complained about past problems with the Memorial and the frustrating government bureaucracy. The reason for this was that the FDR Memorial proposal was not a new one; fourteen years earlier he believed that the Memorial would be a reality. 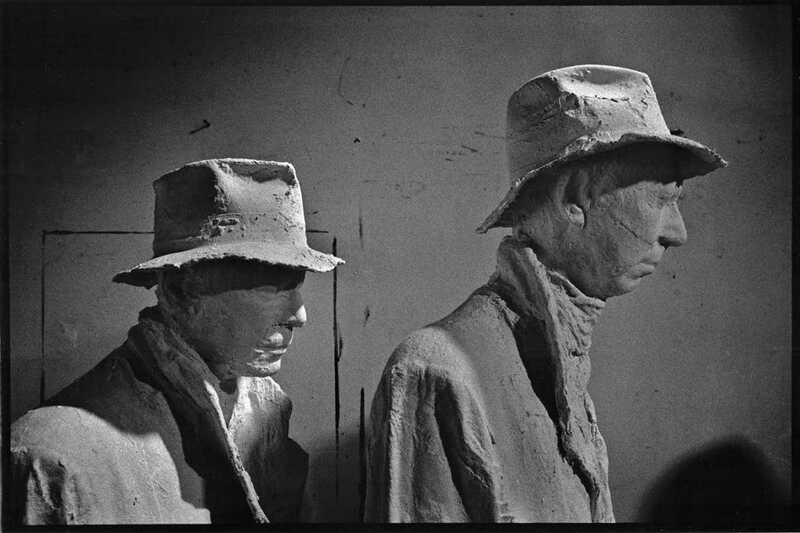 In 1978 he made his first sculpture for the FDR Memorial, Appalachian Farm Couple- 1936. 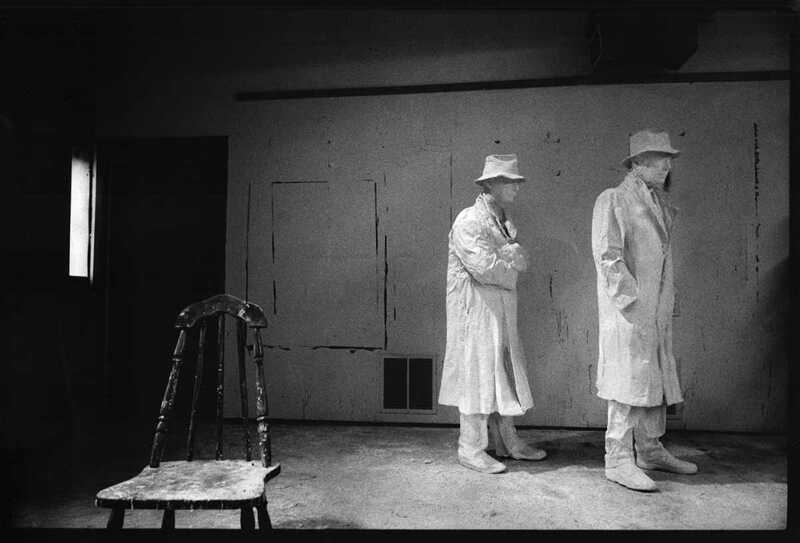 The white figures of a man and woman, standing in front of a wall of vertical barn boards with a door, was never used for its intended location in Washington. 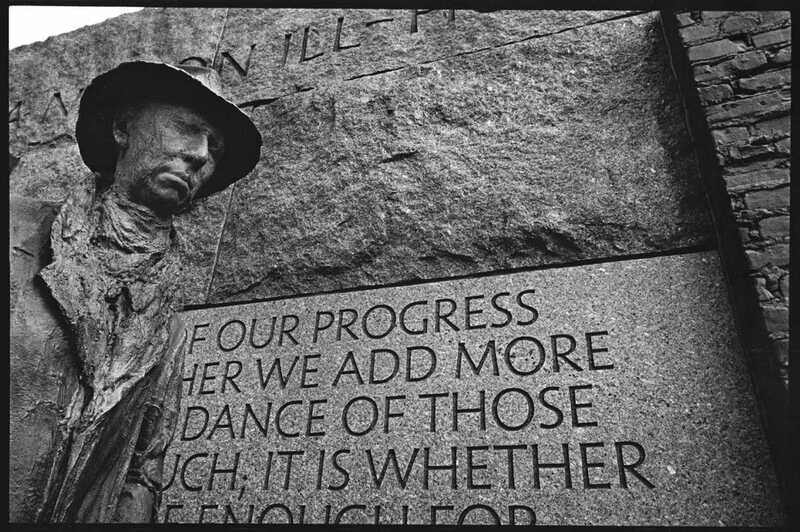 The FDR Memorial was the project of Lawrence Halprin, California landscape architect and designer. 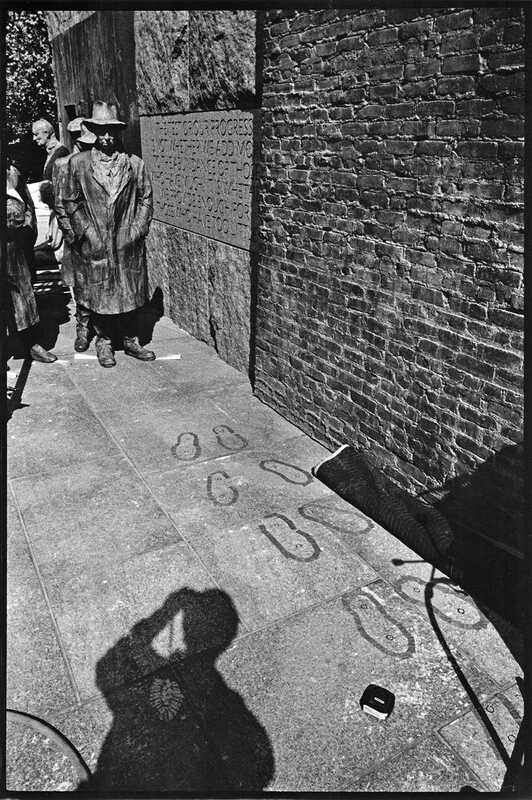 Halprin asked four artists to collaborate and contribute works to be used in the Memorial: Leonard Baskin, Neil Estern, Robert Graham and George Segal. With the approval, George could now move forward to refine and crystallize his ideas for three sculptures for the Memorial: Appalachian Farm Couple, Fireside Chat, and Depression Bread Line. 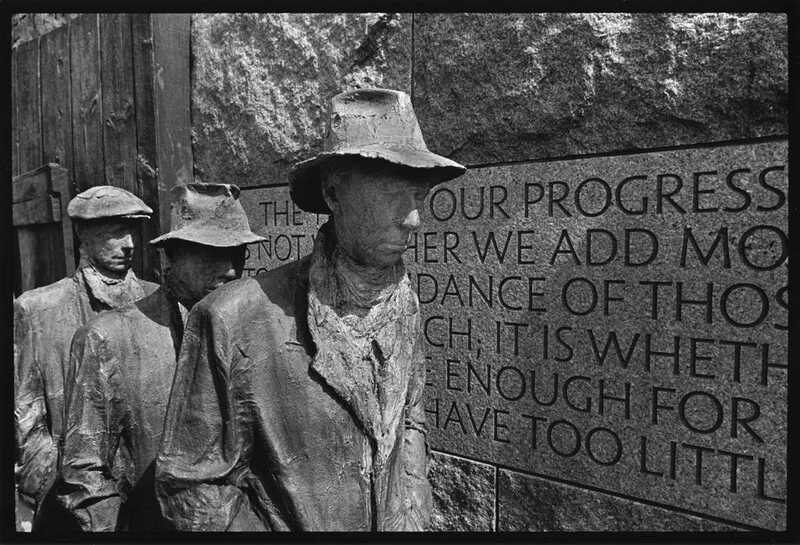 At various meetings some fourteen years ago (this project had a long, stormy, uncertain history), I felt strongly that my own sculpture should not deal solely with images of FDR, but should evoke the emotional tenor of FDR’s extraordinary four terms: how it felt to live during the Great Depression and World War II. Since I was eight when the Depression started, one of my most vivid memories was of my father shushing everyone in the room when Roosevelt began one of his fireside chats. My wife remembers the same thing in her family. FDR had a looming, intensely personal relationship with millions, who were convinced he was compassionately on their side. We all cried when his death was announced on the radio in 1945. I spoke to some people who had actually stood in bread lines. Far from the noble, dignified, stoic enshrined Worker-Hero, they were furious with anger, each responding to the dictates of his own nature, completely individual. 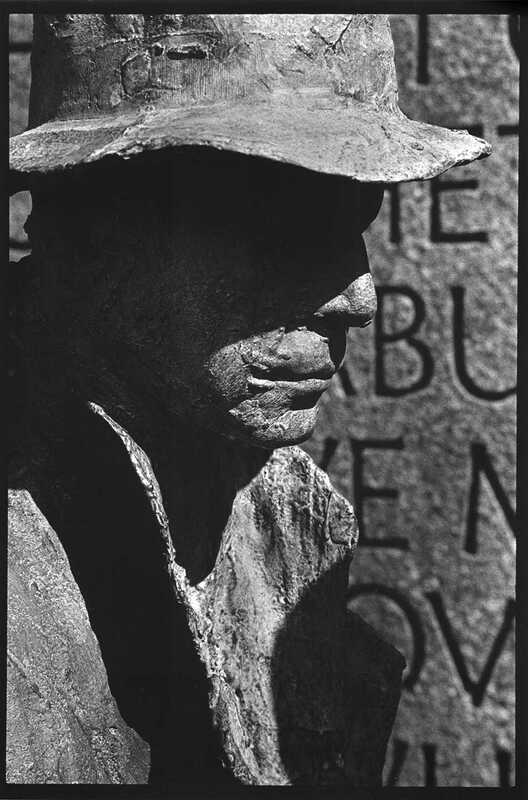 When word got out that the Memorial was finally approved, and that George would be commissioned to make three sculptures, he received many calls from friends and acquaintances volunteering to be models. He was annoyed by this, and he made no commitments to anyone who wanted to model for one of the eight figures. 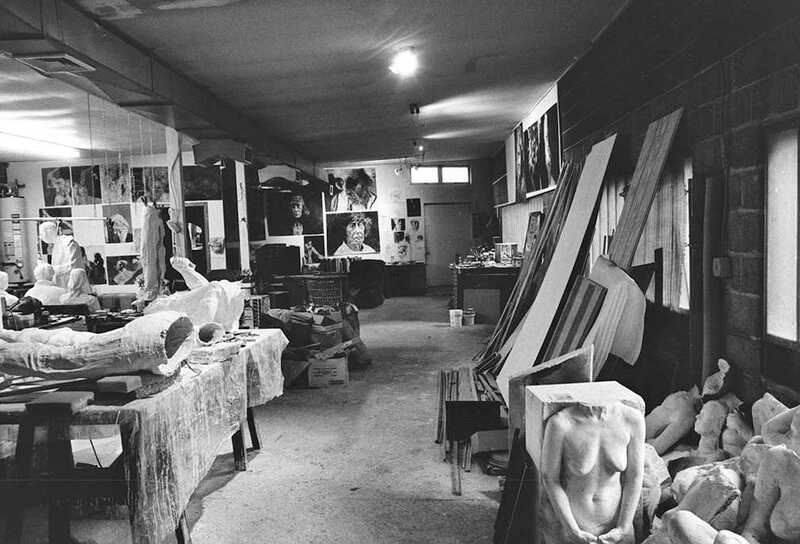 One of the reasons was that Segal’s ideas for the sculptures were not yet finalized in his mind. George had to do a great deal of research on the Great Depression. He went to several libraries, including the Rutgers Art Library in New Brunswick, looking for information and photographs, and he spoke to people he knew who lived through the Depression. Finding period photographs was important to George. 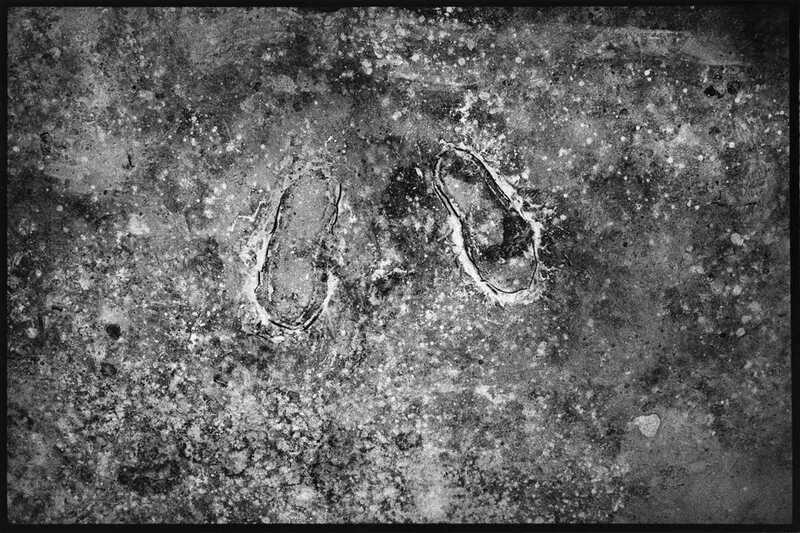 He looked at newspaper and magazine press photographs, and those by Dorothea Lange, Walker Evans, Arthur Rothstein, Russell Lee and other FSA (Farm Security Administration) photographers. He studied photographs of people listening to FDR (Fireside Chat) on the radio. He looked at photographs of people standing in line at soup kitchens, and lines of jobless and homeless people across the country. 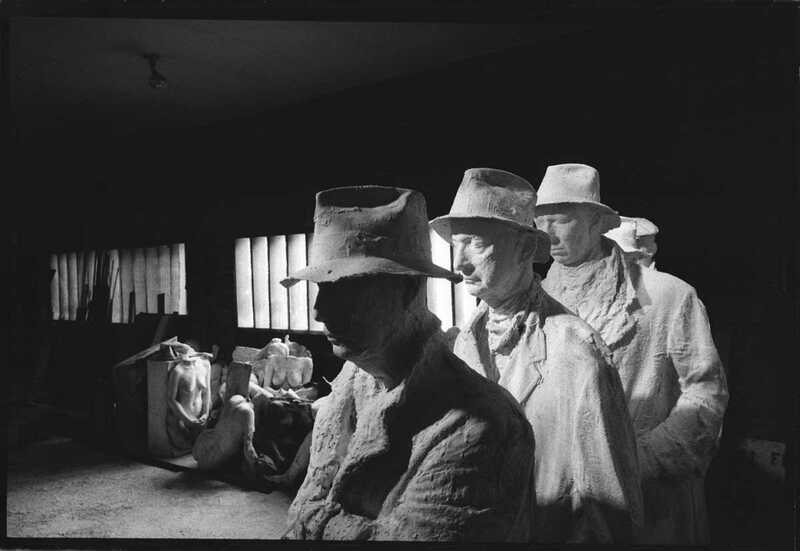 Photographs like White Angel Bread Line, San Francisco 1933 by Lange caught his attention. George also admired the series of photographs of the Burroughs’ family from Alabama by Evans. George was very deliberate and thoughtful with every aspect of his art. He knew what he wanted to say, and he was careful to be true to his ideas in the creation of a sculpture. 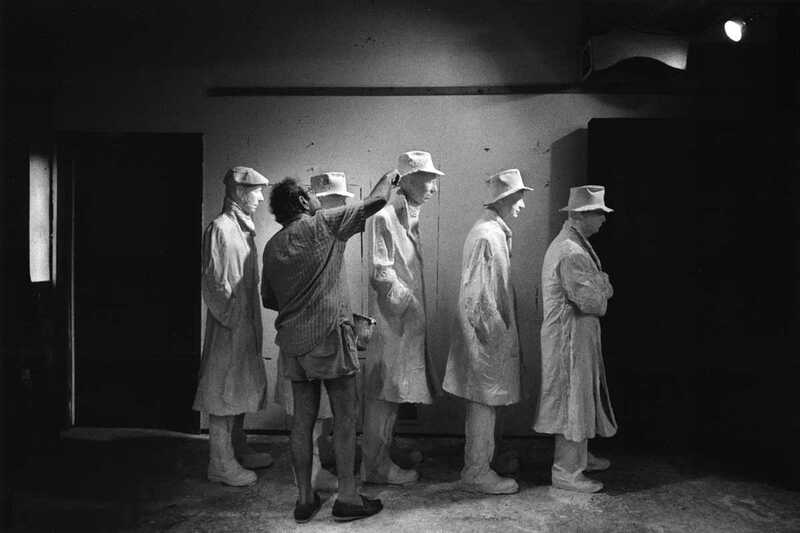 While working on a sculpture, George said to me many times, “I have to make this convincing.” I believe that convincing was not just from the viewer’s point of view, but he had to be convinced that he was being true to his ideas and feelings about the work. 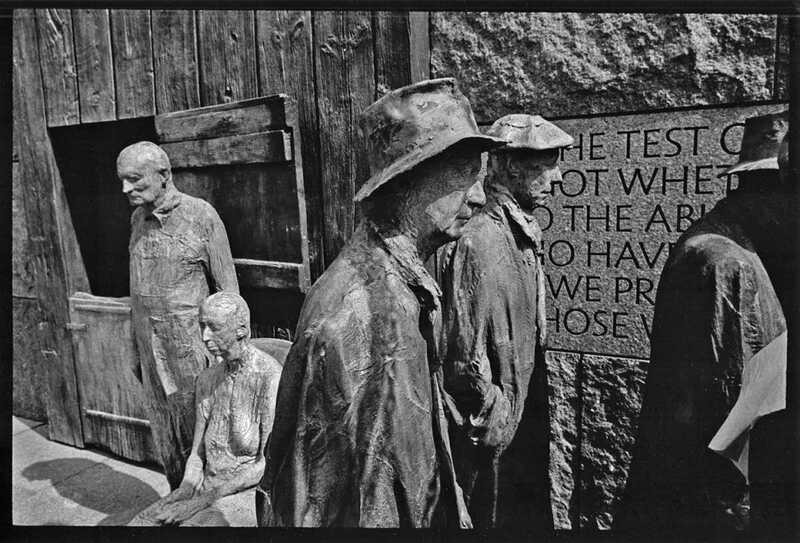 It is interesting that Segal did not use the 1978 sculpture that he made for the Memorial, Appalachian Farm Couple- 1936. Rather, he used the same models, Julie Martin and Billy Klüver, for a new version. The models were older and the woman would now be seated next to her husband, standing on her right. We began this sculpture on July 3rd by searching for wood (barn boards) for the background. We spent the 4th of July casting Julie Martin and Billy Klüver. The work continued on the sculpture almost every day for the next twelve days until it was almost finished. During this time Helen Segal was trying to convince George to be one of the figures in the Depression Bread Line. He dismissed the idea for reasons that he never mentioned to me. But while working in the studio, I told him that I agreed with Helen, and that he should reconsider. 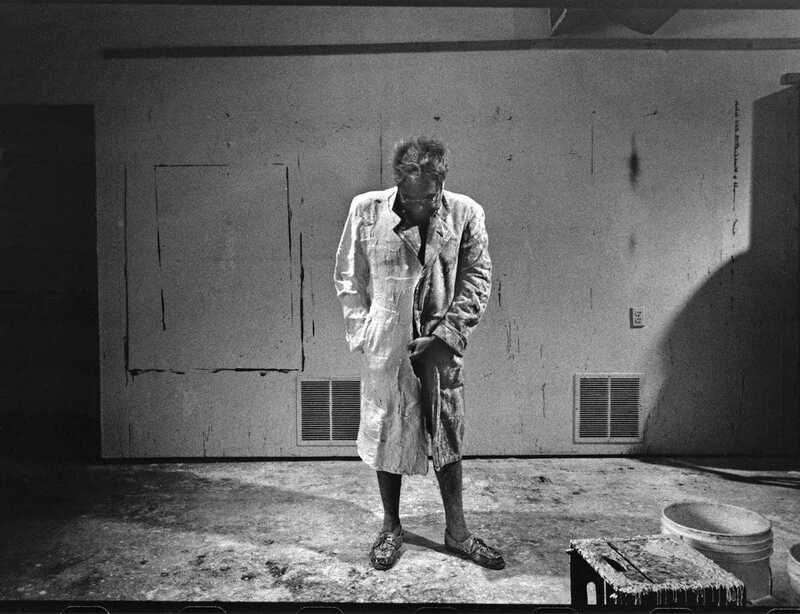 I told him what he already knew, that the self-portrait is a common theme with artists, and that he had made several sculptural self-portraits through the years. We talked about it for a while, and I volunteered to do the casting of him, reminding him of The Graffiti Wall 1990, a sculpture for which we were both models. 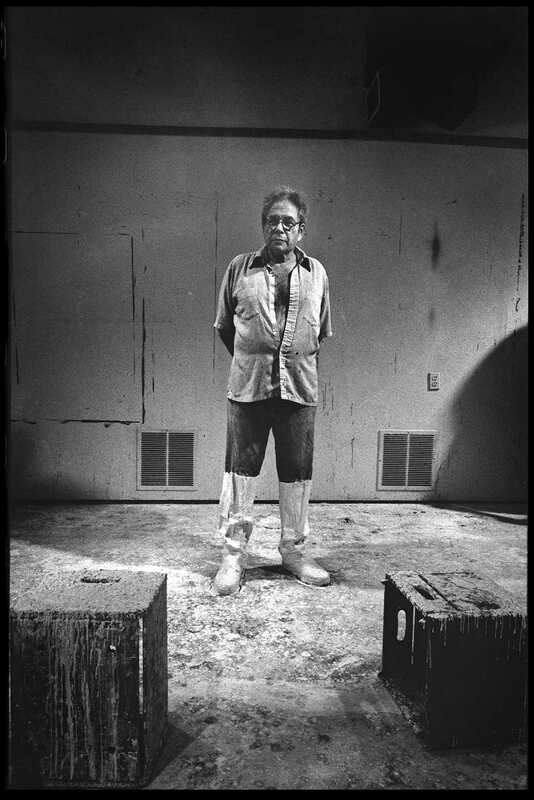 For that sculpture, I cast George seated on a milk crate. I mentioned that Helen could come out of retirement to again be my assistant if he agreed. He smiled, but I got no answer. Later I learned that he did agree to be in the Depression Bread Line, probably with a little more encouragement from Helen. 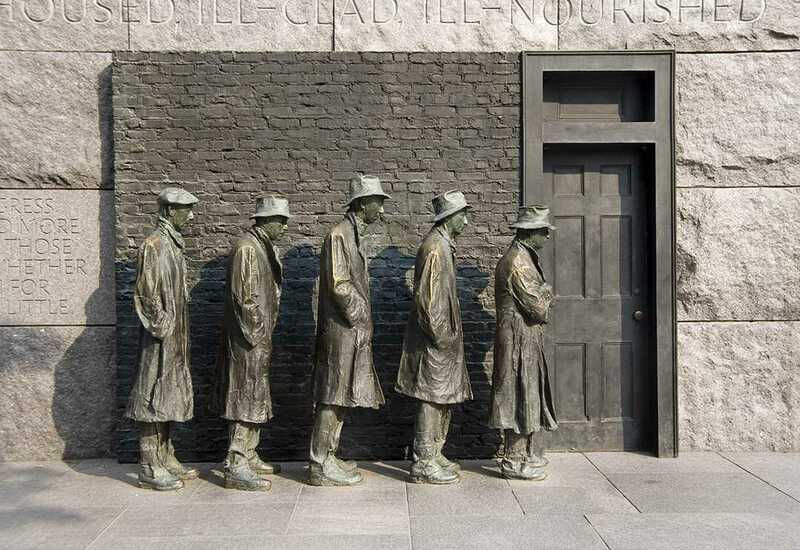 Since the Depression Bread Line was to depict a historical event during the Roosevelt administration, George wanted the models to wear appropriate clothing. I searched the Metropolitan Area for vintage clothing stores that would have 1930s clothing that the average person wore. Most stores were about fashion and retro styles, but I did visit a woman in North Jersey who supplied costumes for productions on Broadway. I looked at the selection and decided that George had to come to this place to choose the clothes for the models. A couple of days later we made the trip together. George was thrilled; he purchased two 1930s fedoras, a couple of long wool coats and a pair of vintage shoes. On July 16th we began the Depression Bread Line, with the casting of George. Helen did help that day and everything went smoothly. We took our time because I didn’t want to make any mistakes. A full figure, casting the legs, torso and head separately usually took us about two hours. With this sculpture, it took just under three hours. 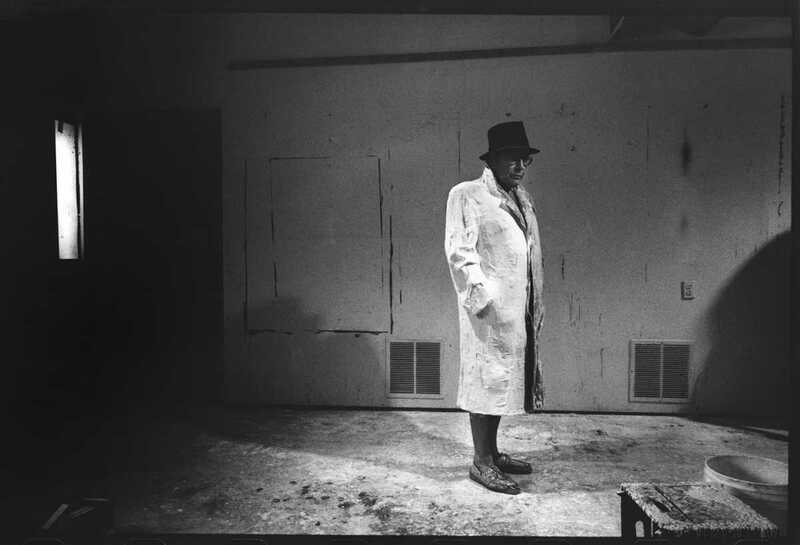 It was a little more complicated since George wanted to cast the torso (the coat) in two parts. Also, I wanted to make photographs of every step of the process. 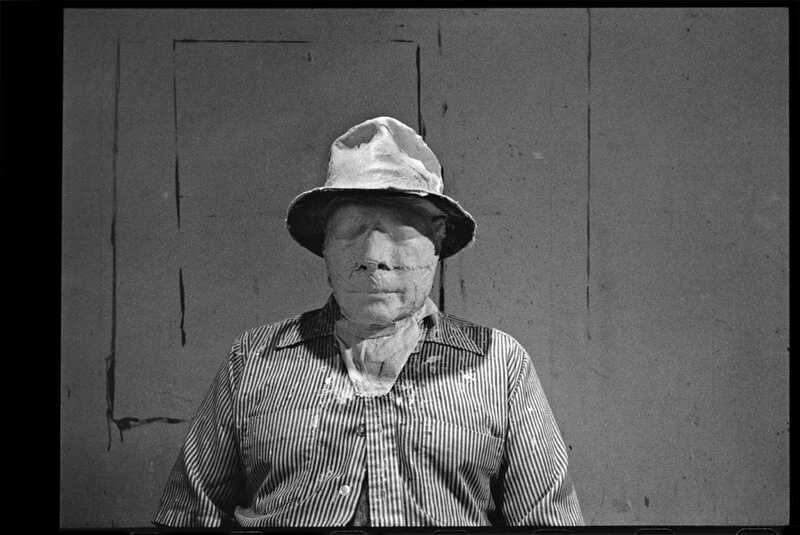 George was a patient model for both the sculpture and the photographs. On a later day, after working on the sculpture for some time, we needed a break. George always sat on his well-worn brown leather recliner and I on the orange plaster-splattered wicker chair across from him. The radio was set to a classical station and the music was very relaxing. 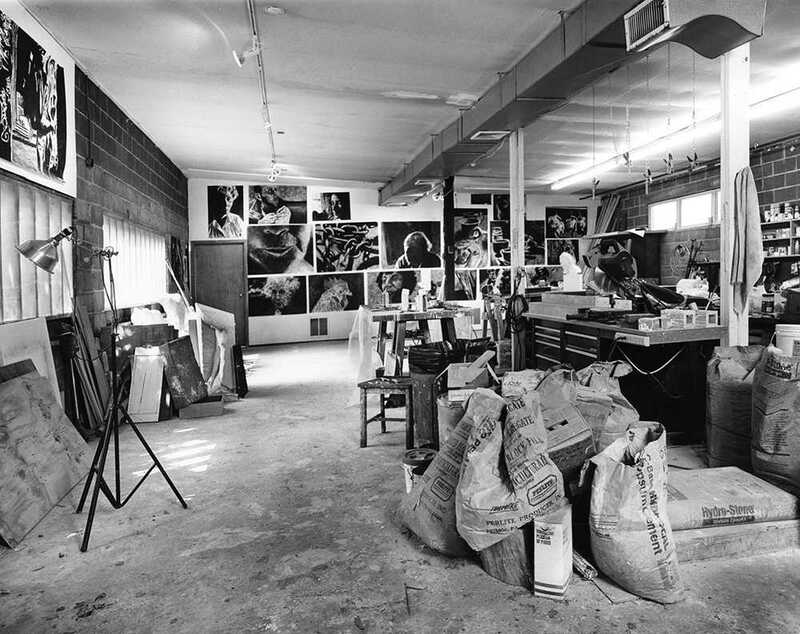 The conversation had nothing to do with the project or the art world. Suddenly George unexpectedly interrupted the thought and said, “Do you want to be in the Bread Line?” It took me a nanosecond to say, “Yes!” George just smiled. George made another decision about one of the models for Depression Bread Line. He wanted someone who lived through the experience so he chose Leon Bibel. Leon was a longtime friend and artist who was part of the New York City W.P.A Federal Art Project in the 1930’s. He lived down the road, on the same street as George. Leon was cast the next day on July 17th. I was the third figure to be cast. The casting took a little over two hours, and all went well. Later, as usual, we filled the cast made with the plaster impregnated Johnson & Johnson bandages with cheesecloth dipped in Hydrostone plaster. When the bandages were removed, revealing the sculpture, there was always a lot of work to follow. The pieces had to be assembled in a way that matched the original pose of the model. That was the most critical step, and George was very concerned with that. 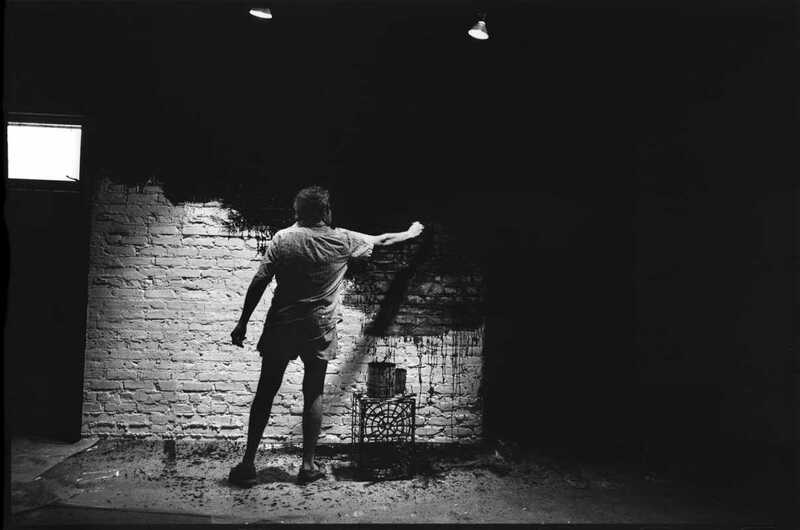 He often said that the gesture, the pose, “had to be convincing.” The seams where the pieces were joined to each other required additional work, and air bubbles formed during the original casting had to be filled. Although the casting of the model only took about two hours, it was far from complete. It usually took about a week to complete a single figure, and if there were multiple figures in an environment that had to be constructed, it could take months. 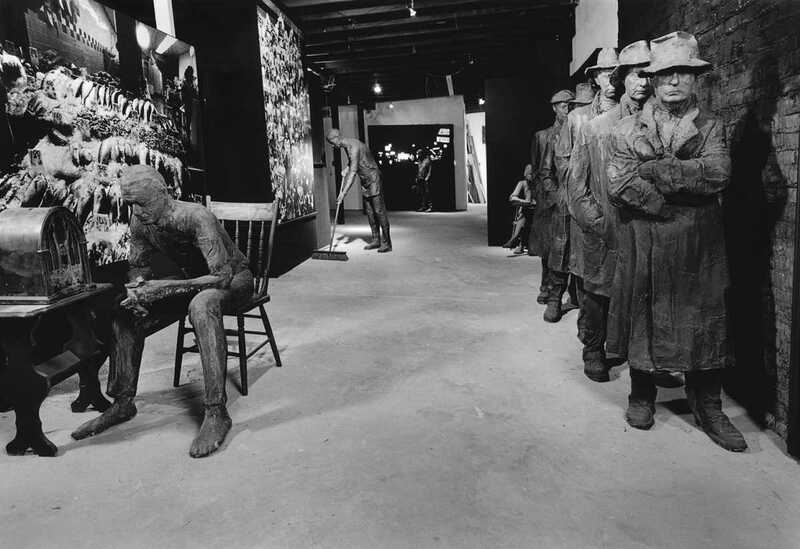 At this point we had completed three of the five figures for the Depression Bread Line and there was no predetermined order of the figures for the final sculpture. 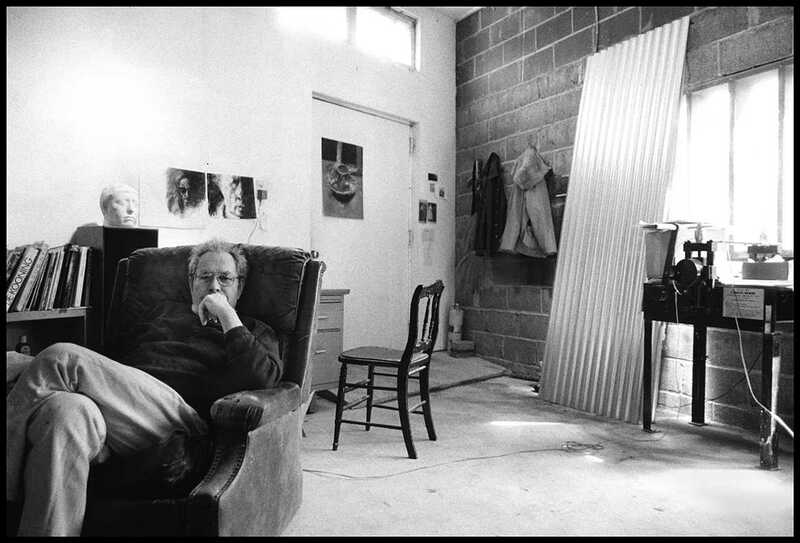 On August 4th we cast Martin Friedman, former Director of the Walker Art Center in Minneapolis. Martin retired from the Walker and now has a beautiful place in New York City. 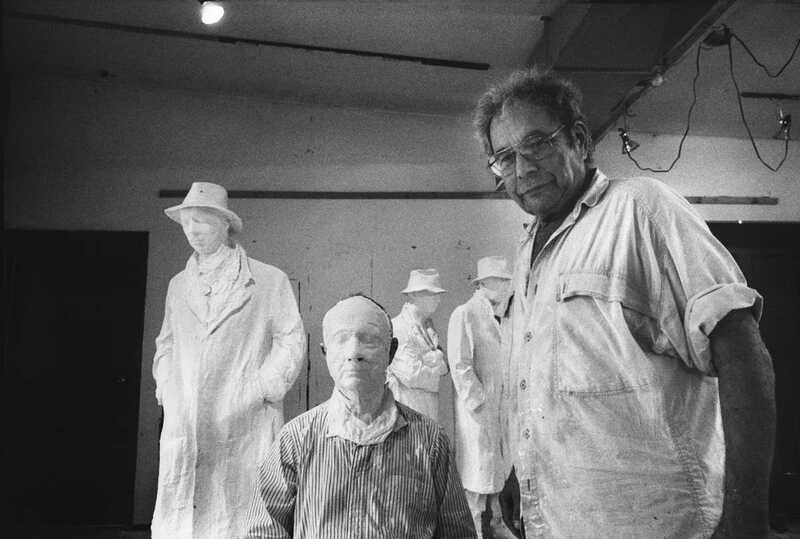 When the casting was complete, Martin asked George if he could keep the fedora that he wore for the sculpture as a memento for the experience. George agreed. 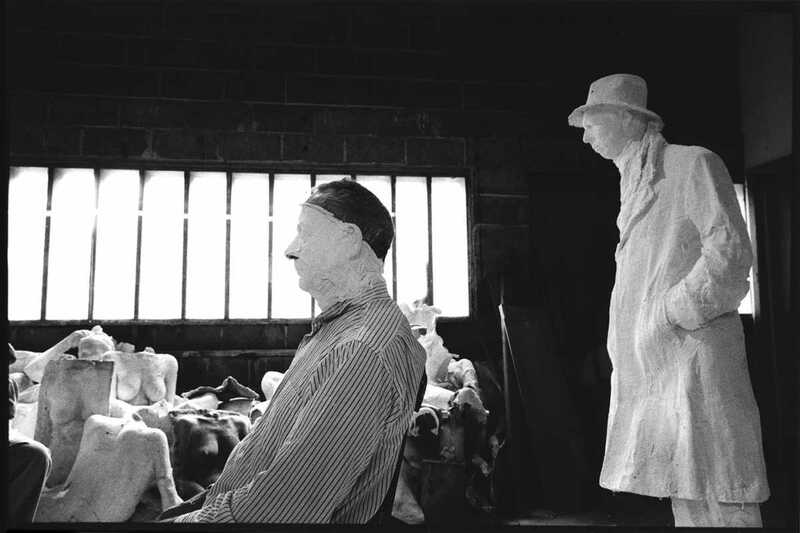 After each model was cast for their sculpture, George made another small casting of the heads. These reliefs were about 18×16 inches. It was a small composite of two elements of the final sculpture. 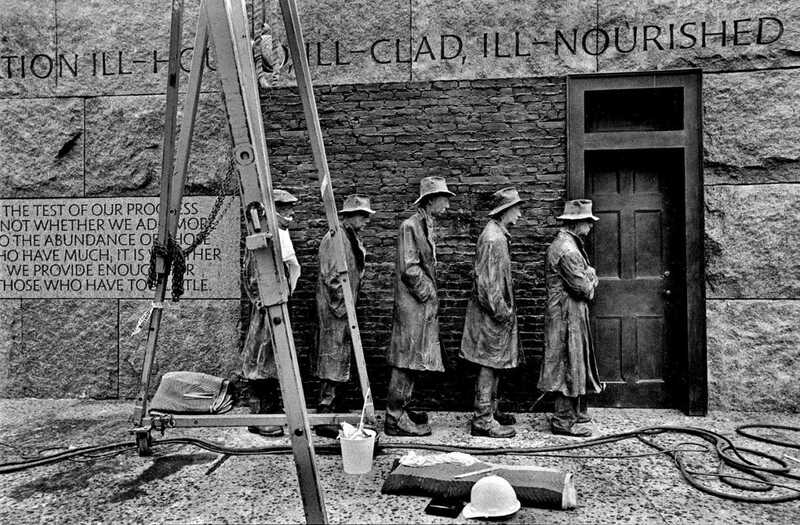 Each head was mounted in front of a section of the brick wall that was used for the Depression Bread Line. It was George’s way of thanking the models, and a remembrance of their participation. George gave me the small sculpture of my head, and while I was studying it he said, “I know what you’re going to say. You’re going to say it doesn’t look like you, and I’ll say- it will.” In fact, I was thinking that it didn’t look at all like me. But George, borrowing the Picasso quote about his portrait of Gertrude Stein, said, “Everybody says that she does not look like it but that does not make any difference, she will,” I think was very perceptive at the moment. The last figure to be cast for the Bread Line was Daniel Burger. Danny was a long-time friend and Manager of Merchandising at the Mezzanine Gallery at the Metropolitan Museum of Art in NYC. I was not involved in casting this model, only in finishing the sculpture with George. George, wanting the five figures cast before he left for Rome on August 12th, cast Danny himself. Toward the end of August, we cast Miles Forst for “Fireside Chat.” Miles was another longtime friend of George, an educator and artist. The Depression Bread Line took most of our time during the summer of 1991. The five figures were now almost finished. We moved them in line and tried a few variations. Finally George decided on the final order. 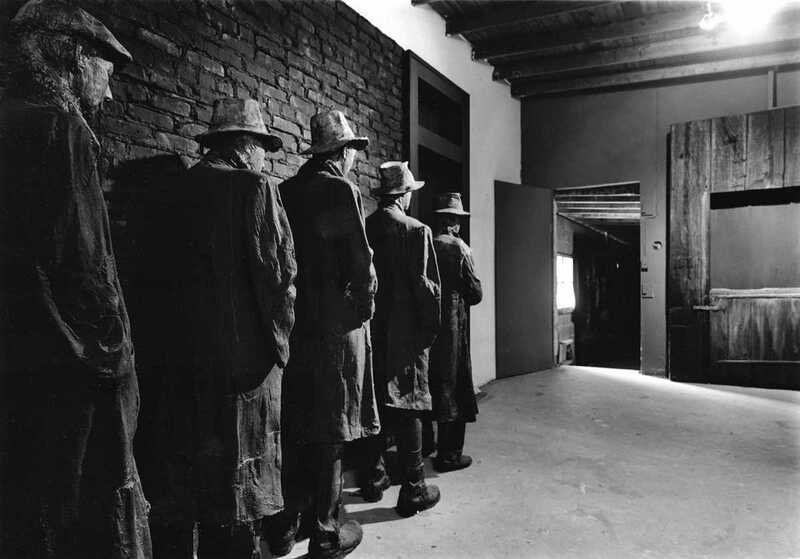 Leon Bibel was first in line, followed by Martin Friedman, Donald Lokuta, George Segal, and finally Daniel Burger. We then went back to each figure and worked on the details of filling small holes from air bubbles during the casting, rough edges were tended to, and small missing areas were rebuilt by hand. George and I worked on those finishing touches together. When I got to the sculpture of myself, I noticed a line that looked like a scar on my right cheek caused by the overlap of the plaster bandages during casting. I remember finding what I believed was a flaw when working on other sculptures with George, and I would ask George if I should fix it. Sometimes he would say, “Leave it. It’s part of the process.” I thought about that for a while and decided that I really didn’t want that sculpture in Washington to look like there was a three-inch scar on my cheek. Although I didn’t ask, I was sure that George would agree that it was a distraction, so I made that repair. 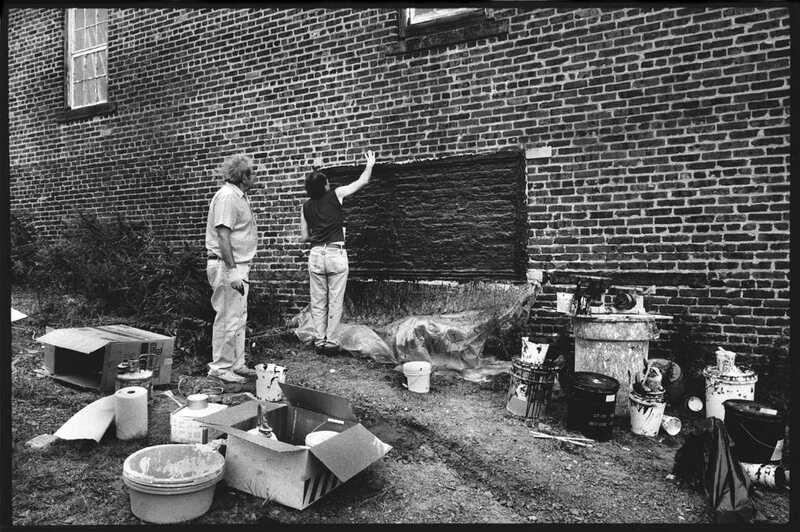 In September, the brick wall was cast at Rosie’s, an architectural salvage yard in New Brunswick, and the place where George often shopped for windows, doors, and other items for his sculpture. A rubber mold was made with the help of the Johnson Atelier. In the studio, we used the mold and filled it with a layer of Hydrostone plaster with a reinforcement of cheesecloth, and created multiple pieces. 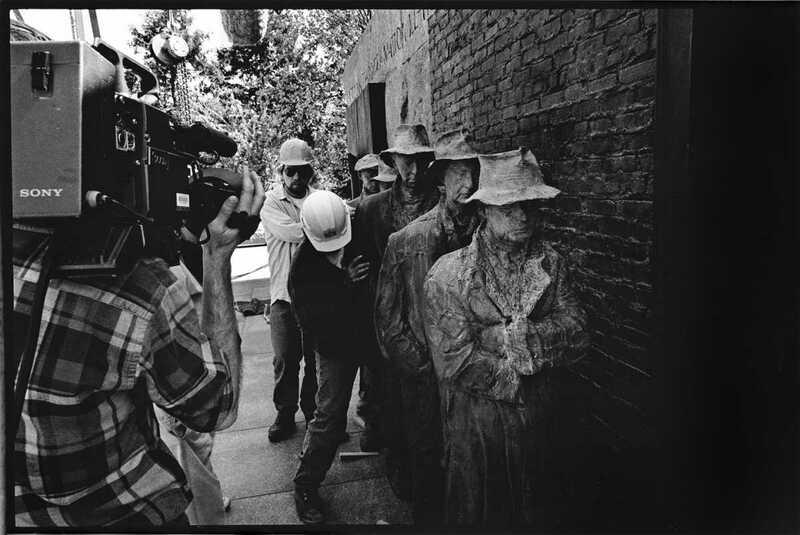 The pieces were joined together to create the nine-foot high brick wall that was the background for the Depression Bread Line. 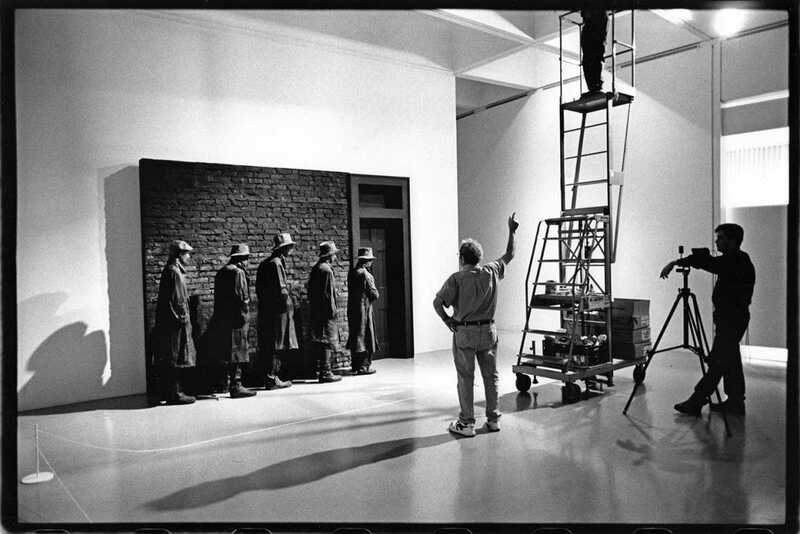 In October, George painted the figures and the wall. 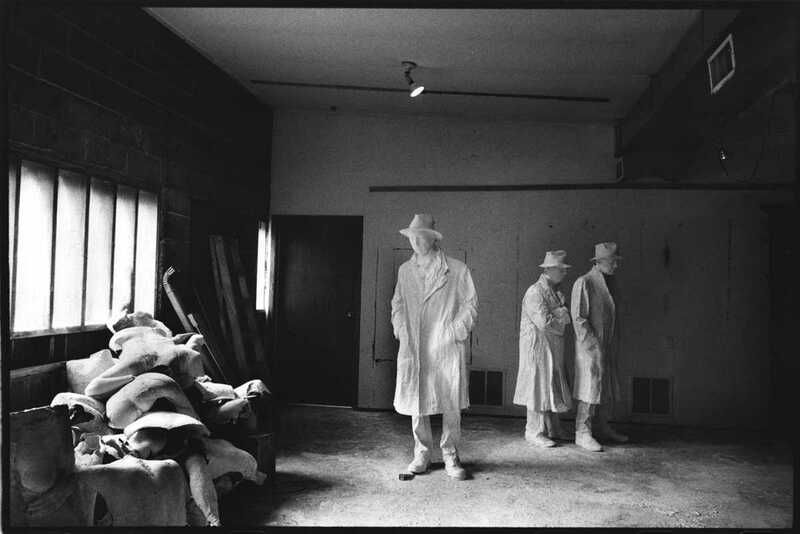 The Sculptures were first shown in the exhibition: George Segal: Sculpture for FDR Memorial, Washington, DC in May 1991 at the Sidney Janis Gallery in New York.